Select how many decimal places you would like the result rounded to. Note that you can change the number of places before or after calculating the missing length. Also note that the Pythagorean Theorem Calculator will always display the raw results (out to 14 places) in the steps that will appear beneath the calculator. Select the right triangle side you wish to solve for. Enter the length associated to the label on this line. This is the missing length of the right triangle. This is the area of the right triangle formed by Leg a, Leg b, and Leg c (hypotenuse). The formula used is, Area (K) = 1/2 x b x a. This calculator will use the Pythagorean Theorem to solve for the missing length of a right triangle given the lengths of the other two sides. Plus, unlike other online calculators, this calculator will show its work and draw the shape of the right triangle based on the results. Finally, the Learn tab also includes a mini calculator that checks to see if the given lengths of three sides of a triangle form a right triangle (Converse of Pythagorean Theorem). 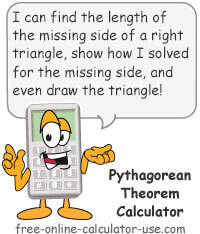 If you are unfamiliar with the Pythagorean Theorem, it may help to visit the Learn tab before using the calculator. Select the number of decimal places you would like the calculated measurements rounded to. Select which side of the right triangle you wish to solve for (Hypotenuse c, Leg a, or Leg b). Enter the two known lengths of the right triangle. Tap the "Calculate Unknown" button. This will solve for the missing length and, if you have an HTML5 compatible web browser, redraw the triangle. What the Pythagorean Theorem is and How It is Used. a = the length of the vertical side. b = the length of the base. c = the length of the side opposite of the 90° angle. Based on this relationship, we can isolate each unknown length to solve for it. If you already know the lengths of all three sides of a triangle, the Converse of the Pythagorean Theorem can be used to determine whether or not the triangle is a right triangle. If a2 + b2 = c2 is true, then the triangle is a right triangle. If a2 + b2 = c2 is false, then the triangle is not a right triangle.